The successful Renmore Gymnastics Club members who won medals at the national finals. Renmore gymnasts made club history when four members represented Ireland at the 2013 Celtic Cup Championships in The Isle of Man. Renmore Gymnastic's Ellen Hynes, Emmeline Anghileri and Amy O'Neill and Patrick Flanagan all represented Ireland in the minors category. Anghileri was placed fifth overall, also achieving the second highest floor score of the competition,while collectively the team counted just one fall throughout the competition. In the men's event Patrick Flanagan enoyed a fantastic debut in international competition, hitting personal bests on the parallel bars, rings and floor exercise. 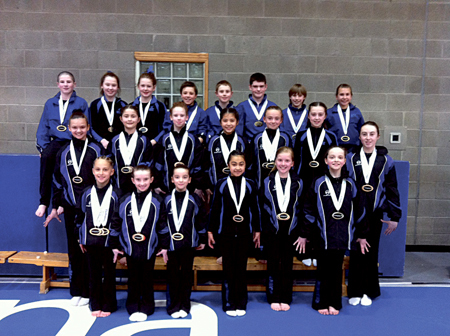 Eighty-five Renmore gymnasts won 100 medals at the artistic gymnastics and tumbling national finals in UL last weekend. In a superb season for the Galway club, the success included 41 new 2013 national champions, 33 silver medal placings, and 26 bronze medal placings across individual apparatus, team results, and tumbling results. Renmore gymnasts were awarded medals in every women’s artistic gymnastics (WAG ) category, while the 2013 National Tumbling Cup was won by Renmore's Sarah Hynes who was crowned the 2013 women's tumbling champion. This is the first year gymnasts competing in women's artistic gymnastics have won medals and national titles in all levels, bringing home a total of 76 medals. The title holders are: Vault: Level 2 Isobel Haugh, Level 3 Kate Kidd, Level 4 Grace Haugh and Nicola Lawless, and Level 8 Aisling Fuller. National bar champions: Level 7 Sarah Hynes and Jane Heffernan, Level 9 Nicole Shaw and Level 10 Erin Shimizu. Beam: Level 4 Anna Kidd, Level 7 Daniela Goluba, Sarah Hynes, Rosalie Hynes, Level 8 Emer Shimizu, Level 9 Nicole Shaw, and Level 10 Erin Shimizu; National floor champions, Level 4 Miriam Fuller, Level 7 Sarah Hynes, Level 10 Erin Shimizu. Twenty-one gymnasts competed in the men’s events, levels 2-5, FIG minors and the new intermediate club grade 1, with Oisin Shimizu winning gold, and Eoin Kelly and Dara Mulhall winning bronze.